I don’t often get a chance to make cakes and cupcakes, because cakes are big and I don’t need to be eating a whole cake. 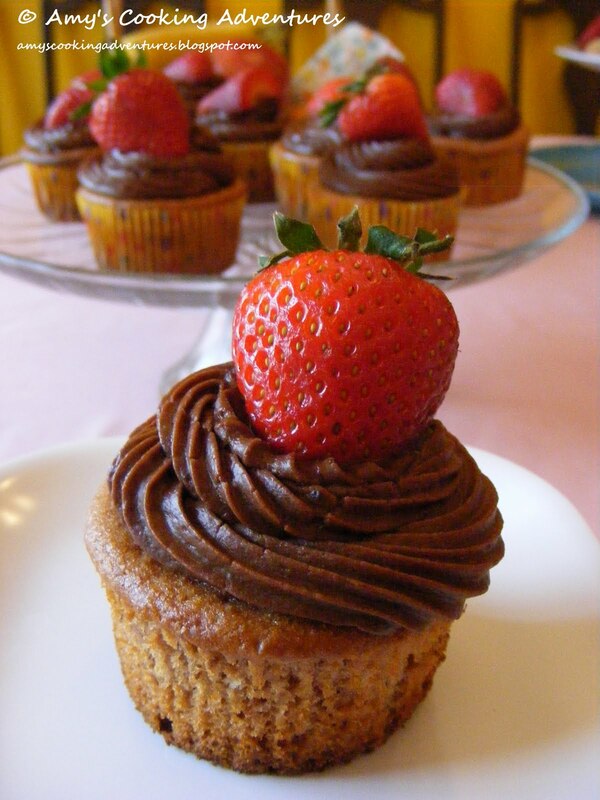 So when my friend Stacey mentioned to me that she’s like chocolate covered strawberries at her baby shower, I decided to take it to the next level and make some Strawberry cupcakes with chocolate frosting…topped with fresh strawberries of course! Can I tell you about the batter? Oh my goodness, it was like cake meets strawberry shake, my husband and I almost couldn’t keep our hands off of it! 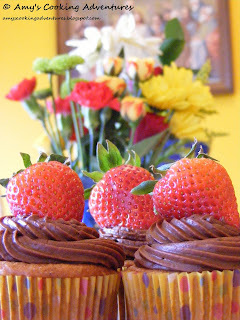 As fabulous as the batter was, the cupcakes were even better since strawberries + chocolate = heaven. And these are made with fruit, so the calories totally don’t count. Go! Make! Enjoy! How cute is my new apron? Love it! Place the partially thawed (or fresh rinsed and stemmed) strawberries in a food processor. Add the milk and pulse until smooth. 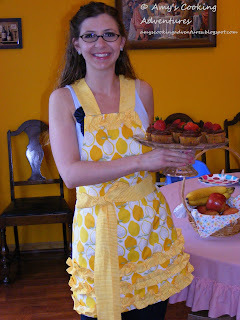 In the bowl of an electric mixer, combine the strawberry mixture, cake mix, eggs, oil, and vanilla. Mix at medium speed for about 3 minutes until well combined and smooth, scraping down the sides of the bowl as necessary. Pour into lined muffin tins and bake 20-25 minutes or until a toothpick inserted into the center of the cupcakes comes put clean. Cool completely. Alternately add in the powdered sugar and milk, adding a small amount of additional milk, if needed, to achieve spreading or piping consistency. Stir in vanilla. Makes 4 cups or frosting or enough to fill and pipe frosting for 24 cupcakes. Once the cupcakes are cooled, place half the frosting into a decorating bag fitted with a Wilton tip 32 (or something similar). Push the tip into the center of each cupcake and squeeze a small amount of frosting in to fill the cupcake. Place the other half of the frosting into a decorating bag fitted with a large decorating tip. 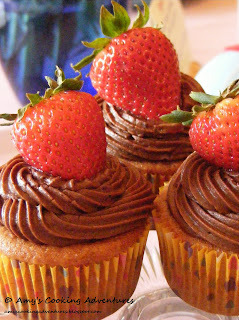 Swirl the frosting onto each cupcake and top with whole strawberries.